Whether your companion animal is a dog, cat or horse he has behavioural needs that have evolved over millions of years and today, he has hard-wired drives that he needs to meet on a daily basis to be happy and healthy. For example, your cat likes eating a variety of numerous small meaty meals a day, sleeping for up to 18 hours and maintaining social company. Your horse is designed to eat up to 18 hours a day, to sleep for 4 – 6 hours – in a number of small bouts – and to maintain a social herd. Did you know that given the opportunity horses pair-bond for life? Horses have drives to live in a herd, but they also pair-bond. As horse owners we should be aware of this. A pair-bond is an extra special friend to watch over your horse, as well as for your horse to eat alongside, groom and play with. Your dog likes to eat once or twice a day with some chewing in between, and he needs to sleep for up to 10 hours a day and maintain social company. There are other needs we need to consider, but you can already appreciate that although all our animals need to eat and sleep, the way they meet these needs may be different. But no matter if you are a dog, horse or cat, you are social animal. This may surprise you when it comes to the cat. While the domestic cat is indeed a solitary hunter, relatively recent research has revealed that while he can survive in a solitary state when food and other resources are limited (as is the case in many homes), where they are plentiful, social structures will develop. Your cat: Encourage your cat to act out natural eating patterns, provide scratching posts and secret hide-a-ways. 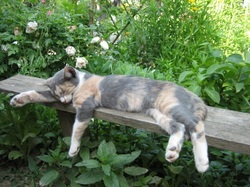 You can also increase his choice of beds around the home and place them at varying heights – cats are arboreal or tree dwelling by nature, they seek high places when under threat. Cats also like to be warm, so consider creating safe, sunny spots for your cats to enjoy. Your horse: Increase your horse’s turnout and turn him out with the same friends everyday. If stabled, stable friends next to each other. Scatter feed hay and treats to mimic his natural need to eat and forage on the ‘move’ and graze for the 18 hours. Your dog: Try to limit the amount of time your dog spends alone. If a friend is not possible, explore doggy daycare in your area, a dog walker, or even dropping your dog off with a friend who works from home. Provide your dog with the opportunity to chew – this is a great activity that keeps teeth clean and provides hours of relaxing distraction. Aim to provide your dog with at least 1 good quality walk a day to meet his need to run, play, exercise and explore. By educating yourself on your animal’s natural behaviours and allowing him to act them out as much as possible, you will be well on your way to promoting a happy and healthy animal companion. A series of five 1-day workshops looking at herbs that help keep animals happy and healthy – in mind and body. Applicable to dogs, cats and horses (and other animals). No previous experience with herbs is required. Explore new ideas about animal wellbeing from herbal traditions and modern science. Learn the benefits of herbs as first-aid remedies, to prevent disease, and to enrich the environment of animals. Create your own herbal first-aid kit for animals from scratch in the practical sessions. Receive five herbs on each module to stock your animal wellbeing garden at home. Enjoy delicious, wholesome food to keep you nourished throughout the day. Take home a full set of course notes and recipes to refer to. 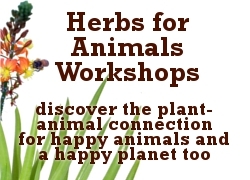 Connect with like-minded people, make new friends that share an interest in herbs and animals.